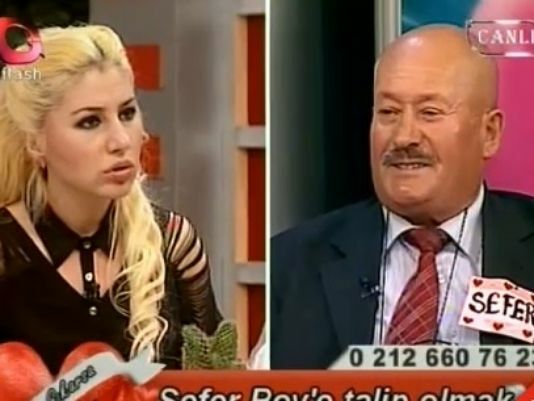 Sefer Calinak, who appeared on a Turkish television dating show, shocked the audience by revealing he had murdered his former wife and a former lover. Sefer Calinak, 62, told Flash TV’s Luck of the Draw he had served prison sentences for both murders and had been released under an amnesty program. “I’m an honest person looking for a new wife,” he said. Sefer Calinak was asked to leave the show by the host, in an episode that made headlines in Turkish newspapers. He explained that he had murdered his first wife – also his cousin – out of jealousy. Sefer Calinak said he then killed his subsequent lover accidentally, “when I swung an axe”. In an interview after the show, Sefer Calinak vowed not to kill his next partner. “Women would leave me after I told them that I murdered my previous wives. But I spent 14 years in jail. I have changed,” Sefer Calinak told the Haberturk newspaper. The head of Turkey’s Media Monitoring Group, Hulya Ugur Tanriover, was quoted by Hurriyet newspaper as saying a complaint should be filed against the program. Hulya Ugur Tanriover said the criminal records of the participant should have been checked.